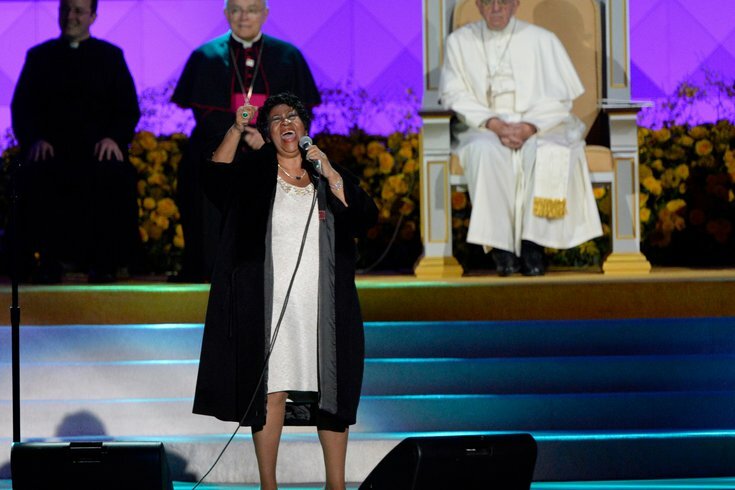 Sept 26, 2015; Philadelphia, PA, USA; Pope Francis watches Aretha Franklin sing at the Festival of Families along Benjamin Franklin Parkway. It has been reported that legendary singer Aretha Franklin is "gravely ill" and currently in the hospital surrounded by friends and family. In March, Franklin canceled a number of scheduled tour dates, including an appearance at the New Orleans’ Jazz and Heritage Festival, due to her doctor’s recommendation that she needed time to rest. She announced in 2017 that she would be retiring, stating, “I feel very, very enriched and satisfied with respect to where my career came from and where it is now." Franklin performed “Amazing Grace” for Pope Francis during his papal visit to Philadelphia in 2015. Her last performance in Philadelphia was last year at the Mann Center on Aug. 26. As the news broke earlier today, many celebrities took to Twitter to send out prayers to the Queen of Soul, including tweets from Mariah Carey, Ciara, Andy Cohen, and Missy Elliot.